Carnitine is an amino acid-like substance that is synthesized in the body from the amino acid lysine. Carnitine is important in the metabolism of fat and energy production within the body, and can help maintain healthy heart, skeletal muscle and liver function. Carnitine may also improve athletic ability. Some carnitine may be obtained from dietary sources, primarily meat since vegetables and fruit contain relatively little carnitine. Carnitine may be most suitable for athletes and vegetarians, if their diet contains low levels of lysine or is high in fats. Carnitine supplements are available in several chemical forms- only the L-form of carnitine is biologically active (the D-form is inactive). Carnitine is responsible for the transport of long chain fatty acids into mitochondria, where energy is produced within cells. Carnitine acts in synergy with coenzyme Q10 in the metabolism of fatty acids during energy production. 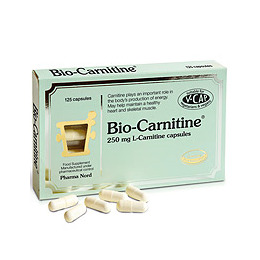 Carnitine is required for the healthy function of heart and skeletal muscle, since these tissues depend in particular on fatty acid oxidation as a source of energy. Carnitine may have a role in cognitive energy and muscle functions. Take 1 Capsule a daily with food or as professionally directed. 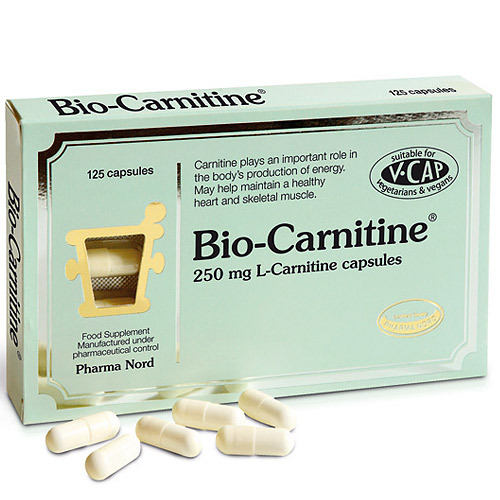 Below are reviews of Pharma Nord Bio-Carnitine - 125 Capsules by bodykind customers. If you have tried this product we'd love to hear what you think so please leave a review.